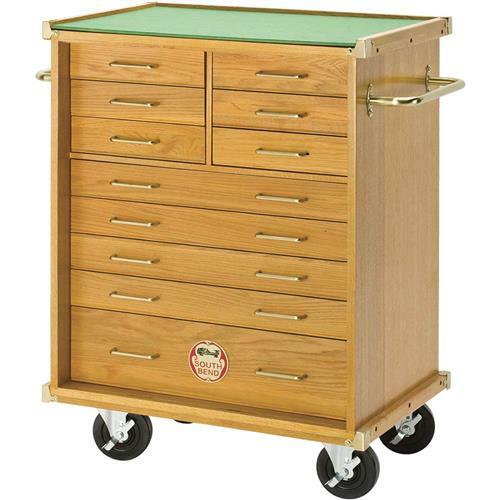 Keep your valuable tooling and measuring instruments close at hand with this rolling oak cabinet. Eleven felt lined drawers for plenty of protected and organized space for precision tooling. Large 5" swivel casters have locking brakes and two brass side handles make mobility around the shop easy. A locking panel also keeps drawers secure and attaches to the back of the cabinet when not needed. 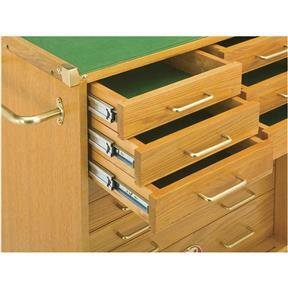 Drawers feature full extension ball bearing slides for smooth operation. Mortise and tenon joinery and brass drawer pulls and corner guards provide strength and good looks. Cabinet measures 38-3/4" high and has a foot print of 28-5/8" wide x 19" deep. The top surface measures 26-7/8" wide x 18" deep and is the perfect place to put the SB1251 Machinist's Oak Tool Box for a complete tool storage system. I have wanted this for quite a while and now that they were finally in stock I purchased it and the upper tool box. Mine is excellent and there are no quality related issues. It looks great and the drawers have slides and seat positively when closed. The casters that came with it are fine and required no modifications. The cabinet arrived in good condition with the exception of a plastic retainer that held the retaining tang for the front cover in place. I had to fabricate a new stainless piece to replace what should have been metal to begin with. Other than that everything seems to be good. I am not loading it with heavy tools, Just run of the mill hand tools. Drawer sizes have worked well, drawer pulls and rollers work very well. 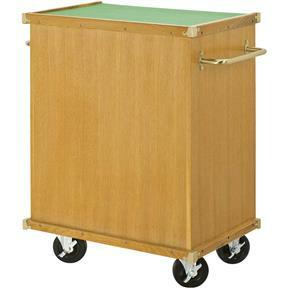 Great roller cabinet, but had to add spacers for the wheels - they would not turn/swivel. The handle does not have mounting points (like the wheels), so I mounted it using standard wood screws. This is not what I would expect for such a costly item. Besides this - solid wood throughout, but cheap drawer bottoms. If you load heavier items, they will quickly get dished.